Absolutely outstanding sunset that you must never tire of seeing. Hmmmm, I recognize that claw!! But I agree, it is a great picture and he better like it or I’m likely to take his claw away from him. I think this is a lovely shot. Perfect sunset! Ok I never knew that… really. Tootie, I heard he’s not only militant, he’s a PIRATE =8^0 – doesn’t that mean he’s sort of DANGEROUS? What a gorgeous sunset. It’s close to perfect. I hope you are having a great day. The first time I ever met that militant sheller, he had that claw. Thank goodness he doesn’t go crawling with it!! And yeah, Tootie, I probably will need one. Can I borrow his? Yeah right!! A militant sheller is totally dedicated to searching for great seashells no matter what the conditions. Hurricane, flood, darkness, big waves… a militant sheller will brave it all in the name of capturing the treasure! Hi Tink, I remember shelling on Sanibel Island when there was nothing but the Gulf and the most fabulous shells just for the picking. No digging needed. Yes, that was in the late 1950’s. We took food as we drove there from Miami (where I was raised after leaving the farm in MI when I was 9)because there was no place to get food. How times have changed. Yes, I think your sheller is very serious. wow… this is one very impressive shot. Great picture. Shelling at Sanibel, that’s living. This is a glorious photo! that is a beautiful shot.. Absolutely gorgeous shot, the sunset is breathtaking. 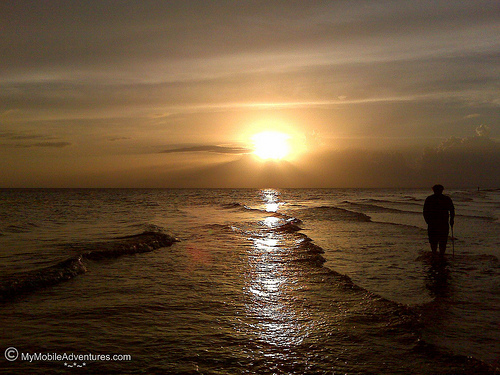 Have never been to Sanibel Island, but it’s on our list of places we want to visit. Thanks for the smilemaker. I am speechless! This is a wonderful photograph. I believe the fellow miltant sheller first witnessed the claw in action 5 summers ago as I went crazy scratching the sand at lowtide around sunset pulling up spectacular shells…. He and his sidekick nicknamed it “The Claw: and it stuck…..I think they ordered theirs that week. What Fun! Sorry I missed you 🙁 Next Time for sure!! !